You are here: Home / All Posts / Support the Arts! Vaudeville Troupe Dark Follies Needs Our Help! Dark Follies presents “Vaudeville on Vacation” June 21 – 23. Dark Follies, an award winning vaudeville style variety show, needs your help to back their newest production: Vaudeville on Vacation – June 21 – 23. Their goal is a lowly $2000, this money goes to rent the theater, printing and promo costs, technical and design costs. They, of course, have other expenses like costuming, props and paying performers and other miscellaneous expenses that are not listed here, but the kickstarter will cover what they call their ‘static costs’. Having the static items covered will allow them to keep tickets prices affordable, allowing as many as possible to enjoy the show, and keep vaudeville on the stage alive. Dark Follies performances normally take place during the First Friday Art Walks from June to September in Portland, Maine and are free for all. Family friendly while still keeping an edge, Dark Follies features the live music of the Dark Follies Rhythm Orchestra, dancing, juggling, side show acts, fire performers and more. 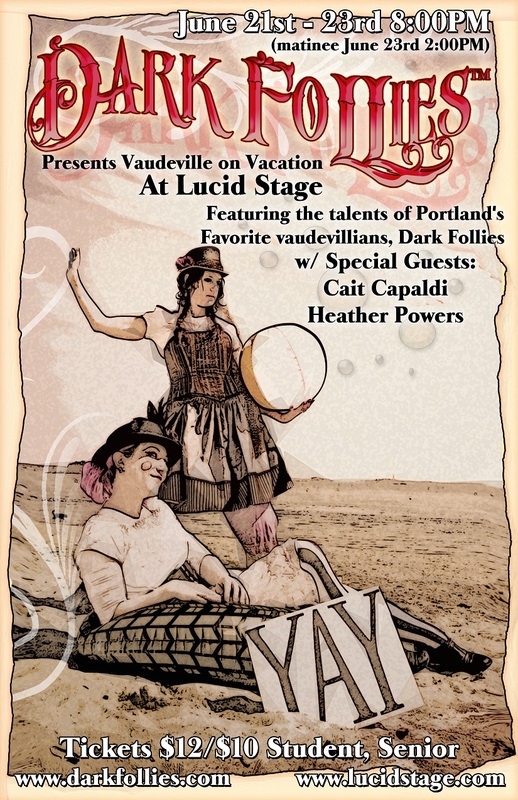 In April of 2011 Dark Follies won the Portland Phoenix Best of Portland Award for best street/ performance artist and also debuted their stage show, “Vaudeville Never Died: It Was Just Resting Its Eyes”, at Lucid Stage. So, don’t just say you support the arts. Do it! Help keep Dark Follies going and growing. Even if you are not in the area, even if you are not able to attend, you can help make this performance a reality. Dark Follies Kickstarter Proposal. Check it out, throw them some love (in the form of cash!) Every little bit helps. Give Us Art! salutes Dark Follies passion for art, performance and killer style! « The Beauty of Struggle: The Art of Printmaker Charles Spitzack!